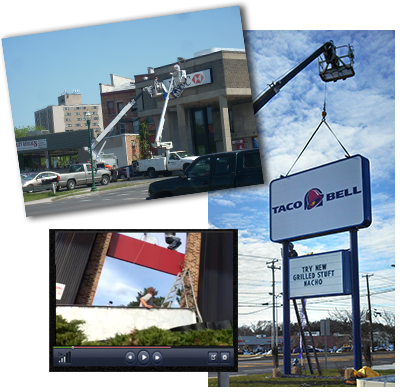 Horizon Signs LLC staffs a highly experienced installation crew. Our installation foreman has 30+ years experience in the sign industry. Our other crew members have been in the industry between 10-25 years. We can think on our feet and problem solve the most difficult installation. Whether we are installing a sign directly for you or for a company you have sold to, we will handle your customer with the utmost care and professionalism, and will treat your property and building as if it were our own. 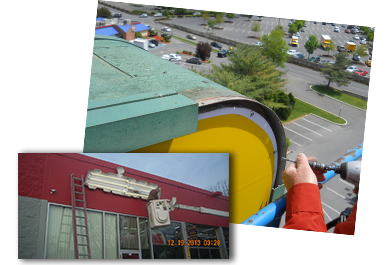 Your existing sign will be removed, existing electric capped off and contained, and any holes or wall damage will be patched and painted, according to the agreed upon scope of work. We will haul your sign away and discard it for you. Your new sign will be installed according to the provided drawings and spec sheets, with safety and the operation of your business our top priorities. Once onsite, if there is a better approach to the sign installation than anticipated, it will be discussed with you and achieved. Your new sign will be tested for electrical connections and the job will be completed as promised. 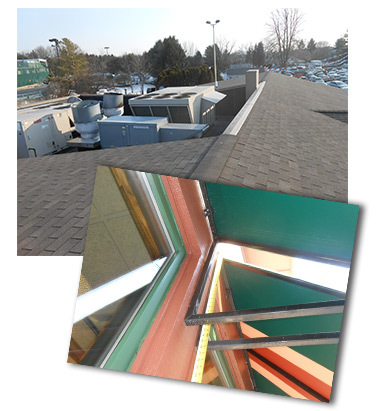 Our lead fabricator has 35+ years industry experience. All signs are custom built to the agreed upon specifications. We will steer you clear of cutting corners and provide you with the best options to keep your signage as economical as possible while maintaining longevity and structural requirements. We use high end components and products that are made to last. 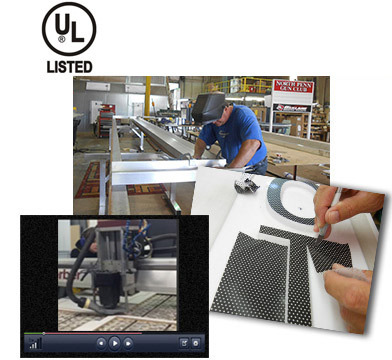 We are a UL Listed (Underwriter's Laboratory) sign shop - all electrical components of our signs meet or exceed current electrical code standards. 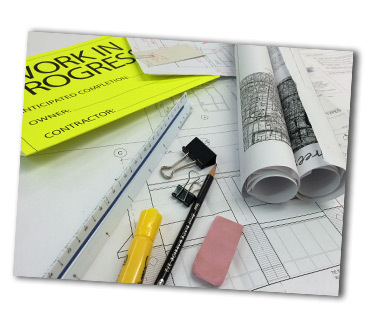 We work with engineers who sign and seal our drawings as required by your municipality. Our welds and fastening methods are above and beyond most competitors. Our paint booth enables us to give your sign the desired finish coat, and we can color match anything - just give us a Pantone Number, a swatch, or we will even visit your site to match the brick or stone on a building. We use AkzoNobel paint systems - worldwide leaders in innovation and sustainability. Our team will work with you to finalize your sign project and keep you updated on your job as needed along the way. Sign service is a vital part of your business. If your sign is not lighting or is in disrepair, it is a direct reflection on your business. Call us with a description of the problem, and we will send a technician out to the site to do a same-day repair, or to determine specialty parts needed or custom repair work. 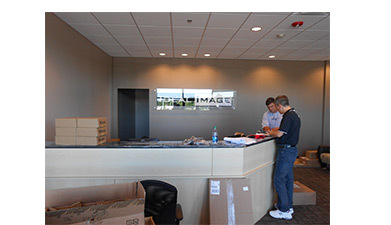 We can service your channel letters, illuminated wall cabinets, neon or LEDs, pylon signs, you name it. We will work with your schedule and provide you with accurate, competitive repair. Your sign project is not always cut and dried. Let us know as soon as you are able of any upcoming signage needs- whether you are moving, rebranding, or simply ready for an update or upgrade to your existing signs. From a simple single wall or freestanding sign to an entire campus of interior and exterior signage, we will meet you onsite, do a walkthrough, and determine your needs and offer ideas and suggestions. We will follow up with a formal proposal. Horizon Signs LLC is known for establishing relationships with our customers, where we are able to anticipate your needs and requirements to become a long-lasting provider of signage for your company. We also provide complete photo surveys and / or technical surveys. We can provide building elevation measurements, sizes and material specifications of existing signage, setbacks of freestanding signs, cut sizes of sign faces for face replacements…you name it. Our surveys will determine the best installation method of your new signage, provide wall detail for engineering requirements, and evaluate the condition of existing footings and structures. Whatever information you need, our in-house surveyors will obtain that information and report back to you. Did you know there are over 400 townships, boroughs, Towns and Cities in seven of our local counties alone? Each has their own regulations, ordinances and permit process. Horizon Signs LLC has worked closely with a large percentage of these municipalities for years. Knowing the ins and outs of permitting requirements helps save you money and time in the sometimes very cumbersome process of permitting. We offer permit procurement for your sign project, including working directly with your landlord's sign criteria and reviewing the zoning ordinance with the township. We will survey your building, obtain landlord approval on your behalf, gather all required documents and plans, fill out the permit applications, and submit the proper paperwork the first time. If your municipality requires engineered drawings, we can obtain signed and sealed drawings of the fastening and electrical detail. Let us do the processing for you, so you can concentrate on the other aspects of your business. Have a project that is making you wonder where to begin? Bring us onboard! We can help you at the onset of your building construction or relocation project. Or if you are considering replacing an existing sign, we can provide you with options and ideas. Let us become part of your team - we will attend meetings, work with different personnel in your company, and work as an advocate for your project. We can guide you in the right direction, getting your business noticed through professional, well-designed and strategically presented signage.